Not since 2005 has Pax Christi had a consultation in this region. The last was in Pattaya in Thailand. This conference came out of calls from the region and with the generous support of Pax Christi International to look at the issues of peace that we face but also to seek a way of responding that is in accord with the spirituality of the region, of Indigenous people, the gospel and Pax Christi itself. Christi as an international group of committed people. The delegates from New South Wales came to the consultation with the intention or aim of attempting to develop or forge stronger ties with people in the region – to know what each is doing and in some way being supportive where possible. This has been the aim of previous consultations and with the Facilitation Group that was set up at the end of the consultation it is hoped that this aim will be achieved. from Aotearoa-New Zealand, the Philippines, Japan, Australia, Sri Lanka, Pakistan, India, Indonesia and Burma, contributed to the Pecha Kucha by telling us who they were and what they were doing in their respective regions either in song, dance, poetry, narrative. Each day, after many sessions focusing on ‘Building Peace on the Ground’ we had a number of Sacred Circles to enable us in groups to reflect and share on what we had heard, how we felt about it, how we were touched by what was said, and what we could do. After conducting an activity called Roadblocks to Peace there was a summing up of the Vision of Peace for Asia Pacific and the Obstacles to Achieving It. This led to what became the bulk of the time together where participants (two per panel) presented on the theme of Building Peace on the Ground: Sharing of Good Practices. It began with Nurturing Indigenous Spirituality with Rangi Davis, a Maori woman from Pax Christi Aotearoa-New Zealand and Father Neles Tebay from (West) Papua. This was followed by another panel Challenging Affluence, Overcoming Poverty with Father Stephen Fernandes of India and Caesar de Mello from Victoria. The next panel was called Living in Harmony with the Earth: Combating Climate Change and Ensuring Sustainable Use of Natural Resources. Despite the tranquility and hospitality of the Filipino people we were made very aware of the violence that plagues this beautiful people and the country. 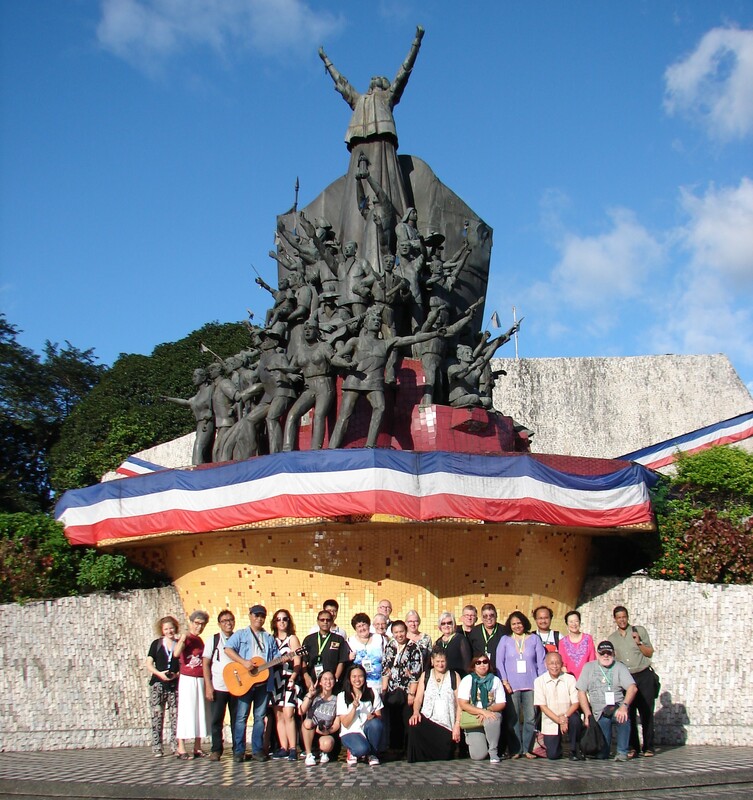 On day 3 of the consultation an exposure trip to a number of locations of significance in Manila was organised. Our first stop was at a parish church in Manila. We were told that this one parish had up to the time of the December visit lost 81 parishioners. The church was huge and could have been a cathedral. After being ushered down a number of flights of stairs to a meeting room we were brought into the presence of women and men and children who had come to share their stories of how their loved ones were murdered. The parish secretary then introduced us to the program strategies that had been put in place for people who had come to the church to seek support. We were introduced to how a parish – one of many – responds to a most unjust and traumatic situation: extrajudicial killings. This evidence based work was not just about the killings but also support for families left behind-the widows, the orphans, the loss of bread winners. One powerful impression amidst all the pain and suffering that was shared was that the solidarity with these people who are being victimised included ‘sitting at the table with the enemy’. We marveled at the commitment of the parish people to engaging with people who have been affected by the drug war that has been instigated by President Duterte. Though the numbers of people killed is unknown except that it was at the time at least 3,000. Nevertheless there is a culture of violence and a culture of fear. We heard what was being done for these people, who have seen, at times, a loved one killed in front of their houses for being or just suspected of being a drug user or drug trafficker. The priests, sisters and many lay people have opened their parish and their hearts to these people who have suffered by accompanying them to provide safety, establishing drug rehabilitation centres and support for families that have lost loved one or have someone in prison. As people shared their pain and anger, it was not always possible to understand what they were saying but it was possible to feel their pain and suffering and anger at this institutionalised violence. The connection with these people who have suffered so much and lost so much was at times overwhelming. It is important for us as members of Pax Christi to reiterate that the gospel call to love the enemy was also in place: the priests showed us through their example, as, difficult as it is that to be peacemakers we have to sit with the ‘enemy’, the abuser or the murderer, to ‘love one’s enemy’. most heartfelt and moving story: the unimaginable experience of witnessing her child being shot before her. It was difficult to know how we could cope with such a moment and beyond. mother related her story through tears there was strength in her resolve to seek justice and respect for her daughter. Other stories followed. It seemed that it was not always clear who the persons were who had murdered their loved ones. They could have been police or drug dealers. This was the lot of poor families who had members who were either addicted to drugs or sold drugs to survive – and bearing the brunt of these extra-judicial killings. There was no sense that an orderly legal process was going to follow for the person identified as addicted or connected to drugs. Police would often take bodies to holding areas where the families were forced to pay huge amounts to retrieve the bodies for burial. Clearly the police were collaborating with holding area owners to profit from these crimes. The parish community in response to cry of the poor in this situation established an amazing number of strategies to respond to this horrible way in which the government under the new President Duterte was dealing with the drug situation. The needs of families affected by these extrajudicial killings varied and the parish community approached these needs in a very strategic and systematic way under the guidance of the parish priest and a priest from another area of Manila that was affected by these killings. This included taking into account all of the areas of need. These needs were divided into three groupings – patient care, family care and community care. It was impressive to say the least to see just how organised this parish was dealing with this crisis. The parish priest said a number of times that people need to be treated – not killed. Church leaders and members and other members of civil community concerned about human rights were directly responding to these extrajudicial killings. When there were offers for those who were drug-addicted or involved with drugs to surrender to the police for rehabilitation there was suspicion and lack of trust as there were many stories of people who had surrendered to police being killed. This situation called for assistance from the priests when approached by those who were affected by drugs wanting to surrender but were unsure as to what would happen to them. The priests would organise a meeting with the police with the goal of getting an agreement from the police that the people who surrendered would not be harmed. The priests and parish workers had also been intimidated by unknown people. agreement was they would not be harmed for six months which was enough time to set up the rehabilitation process for those who had surrendered. Interestingly, a large drug rehabilitation centre was funded by the Chinese government but was only half full. According to the priests the most effective drug rehabilitation program was one that operated within the community because it was based on personal care and developing relationships and inclusive of families. Spanish, then the USA, the Japanese, the USA again, Marcos and now Duterte. Yet, in looking at the faces of young students and many other people, I saw also that parallel to this blood and violence is a river of courage and resistance that was depicted on the T-Shirts that were for sale at the museum – ‘Never forget, Never again’. That courage is seen if we dare look in the lives of peasant farmers, indigenous people, and their supporters who have paid the price for their solidarity against the government corruption, mining corporations that devastate the land and peoples’ lives and corporations that oppress the people in so many ways. The next day two more panels were held: Promoting Peaceful Societies: Towards a World without War with Father Paul Lansu, Belgium and Pax Christi International and Father Nandana Manatunga of Sri Lanka. The final panel was called Promoting Gender Equality and Human Rights for All with Sister Filo Hirota of Japan, and Father Emmanuel Yousaf of Pakistan. with conflict, though it is ever present, but to search for further threats to peace in our relationships with women, Indigenous people, the Earth. The range of topics covered in the panel presentations tried to address this issue. These panel presentations were followed up by presentations and sharing on Achieving Sustainable Development Goals through Our Work on the Ground. This was necessary and important but somewhat difficult to engage with after the panel presentations and the experience of the exposure day. Maggie Galley is the secretary of Pax Christi Australia National Council She became an active member of Pax Christi just prior to the illegal Iraq invasion in 2003 She works part time as an Accounts Officer at Sydney Alliance, a non-profit organisation. Claude Mostowik is a member of the Missionaries of the Sacred Heart ordained in 1976. From 1977 to 1981 he worked in the Northern Territory in various aboriginal and non-aboriginal communities. He has been promoter for justice and peace in Australia for his congregation since 1999. He became Convener of Pax Christi Australia (NSW) in 2001 and also National President in 2009.